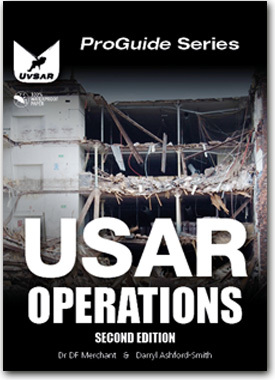 We are proud to announce the Second Edition of our world-famous USAR Operations book, fully updated with the latest INSARAG protocols. Used by thousands of rescuers across the world, ProGuides set the standard for high-quality, clearly-presented information in a compact and rugged format. When the first edition was published in 2008, teams outside of the USA were still developing their search protocols. INSARAG has now become the standard for member and non-member teams across the world, so in the Second Edition we have switched to these protocols for marking, mapping and assessment. We have also improved the clarity of shoring diagrams under low light, expanded the hot cutting section with unique guidance on directed falls, plus important information on safe work at height during shoring construction, and we have refreshed the casualty care pages to include the most popular mnemonics. The factual content elsewhere in the book remains the same, and so does the price!. Each A6-size coil-bound ProGuide is printed on 100% waterproof paper, which can be repeatedly soaked, washed, scrubbed and disinfected without damage. Unlike many other 'waterproof' notebooks, ProGuide paper is produced from polymer film - it can be written on, is resistant to tearing, and will not stick together even after months in a damp pocket. The latest printing technology creates crystal-clear text and graphics that won't scratch or peel away. 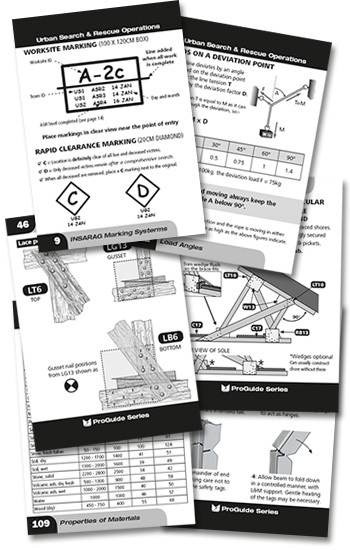 USAR Operations contains 110 pages - not forgetting our unique transparent protractor and ruler on the back cover - with everything a rescuer needs to know from initial searching and safety briefings to step-by-step timber shoring and hot cutting techniques. We cover pulley systems and loads for lifting and moving, confined space access and all the essential tips and tricks, resource lists and data tables you need. Down to the very last nail, every diagram is fully compliant with UK and international standards and is designed to be crystal-clear to understand, even in the dark and the pouring rain. If you wish to order in bulk, have the covers branded with your logo, or pay via offline methods, please contact us. We accept official purchase orders from government-backed rescue teams on credit terms. Bookstores purchasing for resale should click here for more information. Principles of rescue scene management and team safety. Technical search strategies, resources and logistics. Mapping schemes and search safety checklists. Structural assessment - triage flowchart, material density tables and marking systems. 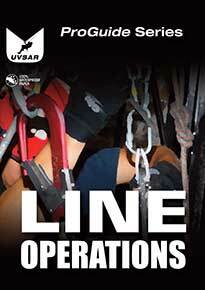 Lifting and moving - crane operations, pulley systems, knots and lifting plans. Timber and Paratech™ shoring - calculations, safety and operational procedures. Timber shoring - nail patterns and detailed construction information for all standard forms. Breaching and breaking - resources, procedures, safety and supervision checklists. Hot cutting - resources, safety and management, cutting sequences. Confined space entry and systems of work. Casualty assessment and life support. What standards does the ProGuide conform to? The search mapping and marking schemes comply with INSARAG. Timber shoring patterns and hot cutting information follows the procedures published by FEMA and the US Army Corps of Engineers [USACE]. We use the UK/EU system of crane operator hand signals. Metal shoring data is supplied by the equipment manufacturers, and all other content is sourced from standard publications and our decades of combined expertise. All dimensions are shown in both mm and inches. INSARAG have their own 'field guide' - what is different? The ISARAG volume III Operational Field Guide is an A4 book covering the strategic aspects of incidents, designed for use in a command post. It includes notes on how to fill in their standard forms and checklists for search and mapping, but does not contain any shoring, lifting or breaching/breaking diagrams, reference tables, casualty care or confined space guidance. ProGuides fill that gap - we do not cover the 'proprietary' command structure in any detail, instead we give operators all the practical information they need to carry out USAR tasks under any management scheme, from multinational deployments to single-building improvised rescues. What are the main differences between the first and second editions? 1. Search marking/mapping now use the 2016 INSARAG designs. 2. INSARAG Assessment Search and Rescue (ASR) levels are included. 3. The UK-USAR search and mapping information is removed. 4. New guidance on safe work at height on shoring. 5. Angled cuts for controlling fall direction are added to the hot cutting section. 6. New mnemonics for casualty care (e.g. NATMIST instead of CHAT for patient handover). 7. Shoring and cutting diagrams have been improved for better clarity in dark or red-light conditions. 8. Tables listing the properties of common materials are now at the end of the book for quick reference. 9. New cover photo, and a new owner's information page that is nore useful to non-fire-service rescuers. Can we have our team logo on the front cover? Yes, subject to minimum quantities or a small per-order setup fee. Contact us for details, describing how many you're looking to purchase and we'll explain the process and how to submit your logo artwork for printing. Typically, branded books will take 10-14 days to produce and ship. We can also pre-print your team contact information on the owner's page if required. Is the ProGuide a teach-yourself book? No - it's an essential reference for use by team members who have been trained or are undergoing training, but does not constitute a training manual in isolation. The skills required by a USAR technician are wide-ranging and require expert instruction and regular practice. Our team/brigade uses Hurst Airshore instead of Paratech - do you have a version for that? Yes we do - the Airshore version is identical except that it includes strength tables for both Airshore and Paratech, and omits the RSS raker diagram. Pricing is also the same, though due to the limited number of teams requesting it, we print this version on demand. Contact us for details. Because of changes to European tax regulations that enforce extra costs and complex data collection duties on EU retailers of 'software', it is not commercially viable to sell electronic copies. Why is it in black and white? Two reasons - first, so the content is equally clear in all types of lighting, from sodium street lamps to chemical lightsticks. Second, to keep the cost down. A full-colour print would not add to the factual content but would put it out of the budgets of many teams, and our goal has always been to get the book into the pockets of as many rescuers as possible - which is why we have kept the same cover price since 2008. We don't follow INSARAG protocols, is this book still suitable? In general, yes - the only chapters that are INSARAG-specific are those covering technical search and mapping. All the shoring, cutting and lifting chapters are completely international. The only issue would be for teams in the USA working under the FEMA command structure, as their marking and mapping systems are entirely unique and not included in this book. I have the First Edition, can I buy just the pages that have changed? Because the spiral binding can be unrolled and individual sheets replaced, it is possible to 'upgrade' the book, though only in terms of the factual content. If you replaced every page on which we have improved the graphics or formatting, you would be replacing the entire book! At this time we are offering upgrade packs to bulk customers (20+ copies per order), details on request. We are considering offering the upgrade packs for sale via our website should there be a demand - the price excluding shipping is estimated at GBP 9.50 per pack. If I use the forms at the back, can I replace them or is the book wasted? We can supply spare packs of casualty forms and grid-ruled note sheets on request. For training use, a PDF copy of the casualty form page is available HERE. ProGuide Line Operations is the ideal companion for technical rescue team members required to operate at height, from basic safety rules to advanced rope rescue techniques.